You don’t have to go cold to reduce your heating bills. All of the following measures can be adopted in whole or in part, depending on your budget and your house. 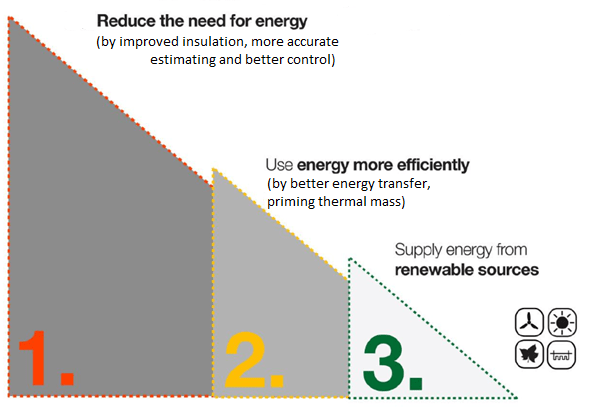 We find the Carbon Reduction Energy Hierarchy diagram (see above image) useful to show what steps can be taken in what order to cut heating bills in a home. Whilst all of these steps imply expense, the prize, over a period of years is attractive. With more than 50% of household energy use in the UK coming from heating, the savings from a lot of these steps below are permanent and annual and make a compelling investment case. Money spent on improving your home insulation will reduce your heating bills. 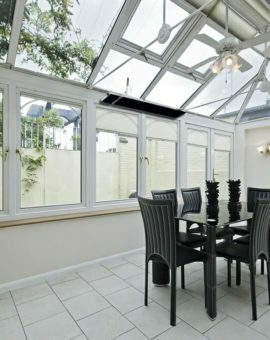 If you have to prioritise, then the key items to improve are the insulation levels in your ceiling, on any outside walls and your glazing (windows and doors). Everything else can follow. Just consider: a building insulated to the old pre 1985 standards could imply up to 2 pence per m2 per hour to heat electrically. A building insulated to modern passive house standards would require only up to 0.5p per m2 per hour to heat electrically. Imagine saving 1.5p for every metre of floorspace every hour over a winter period. Improved insulation can also significantly reduce the cost of your next heating system. Modern heat pumps for example undeniably run at low cost relative to other types of heater. But why spend on the very high purchase and installation costs for a system that will run very little? Charlie Luxton, TV architect and designer made exactly this distinction when putting Infrared heaters into his own low energy renovation project in Cornwall. With the high levels of insulation and other sources of heat (like stoves, PCs etc) he did not need to go to an expense he would never recoup by buying a heat pump: instead he used Infrared panels just to top-up the heat he required to keep the cottage comfortable. Estimate your energy requirements more accurately. Energy-saving heaters of all types challenge us to make more accurate heating requirement assessments. The old rules of thumb much in use in the industry really fail to take into account the characteristics of the building, levels of glazing, the size and type of different rooms etc. The new generation of heat loss calculations as put forward by Herschel Infrared for example – really point the way forward for estimating heating requirements from new generation heaters. Even EDF told us that historical over-estimation in the UK heating industry has required the equivalent of at least one power station just to cover the excess. 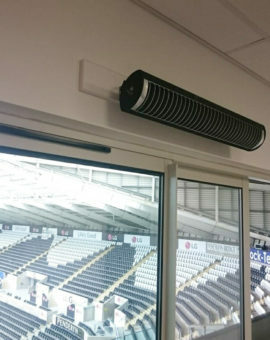 All heaters manufactured since January 2018 have to state what control solution will achieve this for their heaters (if the controls are not built in). But the prize is an 8% efficiency. It is worth noting as yet energy assessment regulations which were last updated in 2012 have not yet recognised this improvement and we await SAP2018 to see if this has been changed. This set of activities concerns the choice of your heating system itself and the nature of the materials you are trying to heat. The key to maximising the use of the energy you do consume is in storage of that heat in the fabric of the building. You don’t want to store heat in the bricks of a storage heater and then let that out into the building. This is the wrong way ’round. The building should become a storage heater in its own right. This way it keeps radiating background warmth even when the heating turns off. This is what is called the “thermal mass” model of heating. Treating the building a bit like a battery, you need to put energy in to prime it, but once primed, you need very little energy to keep the temperature topped-up. 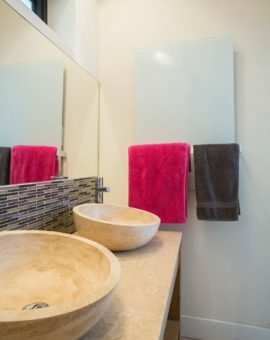 Only radiant heating (infrared) is really capable of priming thermal mass because only radiant heat has sufficient “transmissiveness” to drive energy into the fabric of the building. 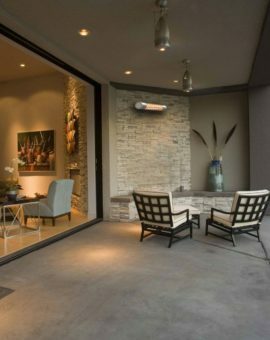 Heaters that warm the air fail significantly to warm the materials in the building (the thermal mass). But because our sense of comfort in enclosed spaces like houses and offices is based on the average of the air temperature and radiant temperature and not just one or the other, we have to compensate for the lack of radiance from central heating systems, by boosting up the air temperature to compensate. 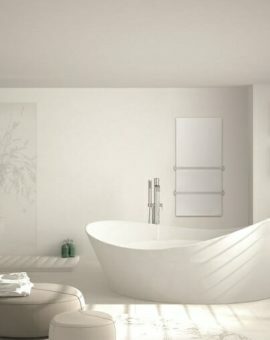 This is why it is common to have stuffy air temperatures with central heating to overcome the cold materials around you: but as soon as you turn the heating off, you feel basically cold again – because you are still losing your body heat to the colder materials and walls of the building which haven’t warmed up. This is also the classic condition creating damp and condensation in a building (warm air over cold surfaces). 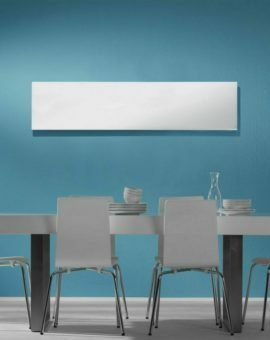 Radiant heating reverses this condition by heating the materials and walls of a building which then continue to radiate back even after the heating has turned off. Air temperature also warms up too, (all objects convect as well as radiate), so you end up with this correct “average” that our bodies naturally seek. And it is an energy-saving model, because the thermostat can just allow the heaters to “tick over” and not have “big on” and “big off” cycles so typical of convection-based heating that are so wasteful of energy. A typical domestic solar installation in the UK generates from 2.8 to 4.4 kWh and while the typical heater installation capacity for a 3 bedroom house insulated to 1996-2002 standards is typically from 6-10kWh, the actual average operating capacity will be somewhere below this (not all heaters on at the same time and not all rooms set to the same temperature). A modern Passive House will require even less heating than this. So, whilst total heating consumption will likely exceed PV generation, the beauty of Infrared is that you can prioritise some or all of your heaters to make use of this free energy. Spring and Autumn days where the sun is shining and the heat demand is low, it is genuinely possible for this heating to be free. As construction standards and building regulations improve, overall heat load requirements (first topic above) can only come down. As a side note, Solar PV and Infrared make use of similar skills and trades, which is not true for other low energy heat solutions such as heat pumps, so installation efficiencies and overall costs can be kept lower. Looking for an effective form of heating this winter? Try infrared! 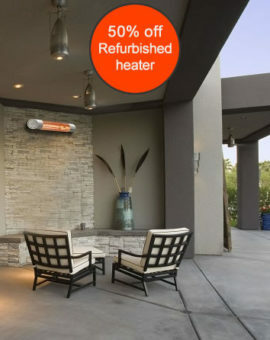 Should you replace your Storage heaters with infrared heaters?